For better or worse, truth is, our deep-seated food and exercise related values and priorities effectively run our lives. Engaging in regular, proper exercise (strength training), and enjoying quality live foods (non-processed) are two behaviors that are vital to losing weight, keeping it off and maintaining and enjoying better health for years to come. With this in mind, the first thing we must address if we want to shift our lives towards stellar health and fitness is to examine how much value and priority we have placed on these two important behaviors. If our bodies become overweight or unhealthy the likely cause is that we have not placed enough value on lifestyle behaviors (our eating and exercise habits) that would otherwise keep us fit and healthy and these low priorities reflect in our actions or lack thereof. Truth is, if you hope to live a long productive life and dance into your nineties you are going to have to place high priorities and high values on what you eat now and how much exercise you get now in order to stay strong well into the future. Nearly 90 percent of the work required to shift your life towards stellar health and fitness is done on the inside first, however, it doesn’t stop there…you must follow through with physical action…they work hand-in-hand to get the job done. When we make a conscious effort to increase our health values, the ideas of healthier eating and regular proper exercise automatically move up a few notches in our value system and our beliefs and perceptions begin to shift. Additionally, the better care we take of ourselves the higher our motivation levels climb as well until one day they become unstoppable. Once your mind is aligned with your goals and your beliefs and perceptions are working with you…not against you then “follow through” with action becomes much easier to perform. It doesn’t matter what sort of beliefs you may or may not have about your after-life. The only thing that matters is what you are actively doing to enjoy the life you are in. You are either actively participating in helping yourself to achieve health and fitness or you are contributing to its neglect. Let’s get real. Deep down you already know that eating a balanced diet of high quality whole foods, drinking the freshest, cleanest water you can find and engaging in regular challenging exercise is the key to stellar health, preventing disease and dancing into your nineties. So, what are you waiting for? 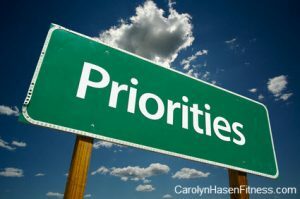 It doesn’t matter if you’ve never made health a priority in your life before. Don’t look back…focus in the now and do it today. Refuse to settle for less…know that your perceptions and beliefs are dictating your value system and your priorities and they in turn are dictating how you direct your life. It all begins with you. No one can place health and fitness at the top of your priority list but you. You must own your health and fitness in your mind first and when you do, your actions and your life will automatically reflect this. Soon you’ll be doing it effortlessly and getting healthier by the day.